Eval Boards | SoleNet, Inc. | Electronic Services, Board Design, FPGA Design, RF Design, Mechanical Design, Embedded Software, System Analysis. Collaboration enhances innovation. Let SoleNet assist your in-house engineering efforts. We'll design and build your Evaluation Boards, Reference Designs or Development Platforms. That's what we are good at. Save your time and sweat for building your own technology. Both low density (90 voice channels) and high density (2016 voice channels) voice-over-Internet-Protocol (VoIP) applications, Arrays of C5x, C6x, and other high performance TI DSP chips, OC-3, OC-12, and Gigabit Ethernet interfaces, and High-end FPGA devices. Multi-input sensor system including DSP and FPGA processors. 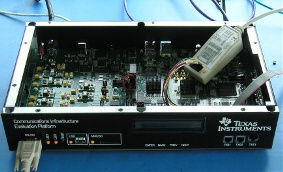 MIPS RISC processors and associated system controller. Multiple 6-Million gate Xilinx and Altera FPGA devices. High-speed, high-resolution D/A and A/D converters.